An important thing happened today; I wish to leave myself notes because they will help me write out my complete thoughts later. This morning my peers in Painting critiqued my work, and most of them saw little connection to the medium itself. They asked, “When will you paint?” All of which brought out more questions than answers. I naturally defended my work, but only to explain my thoughts and the perspectives that I have gained through my reading and personal experiences; these ideas revolve around Craig Owen’s Allegorical paper, as well as Duchamp’s Fountain. It was said that my images had no “Aura” because they were seen as being prints from the computer. I brought about the point that I see no distinction between the digital pixel and a spot of physical paint. Rob mentioned that he too used to think like that until he realized that you “can’t touch” what’s inside the monitor. However, I see the mouse or wacom as an extension of my physical hand, and as I become familiar with and practice alongside this digital format, it then becomes part of my aesthetic vocabulary. My strokes within the monitor are just as expressive as those made in the physical realm, perhaps only because they are mine. You can assign a project to be done digitally, and you may get very similar work from individuals, but I believe that to be on the account of their limited understanding and potential of what can be achieved. Joshua Davis creates very organic work within his digitally coded pieces of artwork; achieving final format that are not capable simply by the human hand. This process becomes complimentary to one’s personal sense of aesthetic because the artist then consciously makes a decision of what he/she believes works or does not. They will go through hundreds of artificially created pieces to pull out elements or give life to something wonderful. My work was once done by the act of drawing my image with pen or pencil and then scanning and reworking my aesthetic line to fit the needs of what I was doing. After a while, I decided to cut out the scanning in some of my work and simply began to draw with the mouse instead, over time it became second nature. The computer replaced the idea of using a projector or optics to create an image. Rob ironically pulled out a computer lap top to show his paintings; did they lose any meaning? Were they less real because they were digital representations? He later talked about his process and how he uses a computer and projector to achieve the ability to trace and work from his reference image. There is something here that needs to be explored; is the painting dependent on technology to achieve its own physical form? Is the human eye much different than a film camera, or even now digital camera? Mankind loves to mimic nature. In Modernism, craft and the mediums are separated; One must look to (Post) Modernism in order to find the potential of hybridization. Technology has always had an impact on Art. The high Renaissance was impacted by the discovery and research that went into creating better pigments and techniques; these secrets or skills have been lost over time. Photography once “replaced” illustration, the figure was once thought to be dead, especially the still life. With the advancing of technology jobs are lost, trade skills are forgotten. The hand crafted letterpress typography, pre-press operator, or even paperback editorial designer. However, there is strength in the idea of uniting all these different mediums to form a new medium of the 21st century. The Industrial Revolution echoed the art movements of its time. Naturally in today’s world of nano power technology, and applications found in the iphone such as music players, navigation systems, phones, and the hundreds of miscellaneous applications; there is a sense of this reflection of the opportunity to mix all mediums together such as painting, photography, video, literature, etc. These are possibly even all best represented through the medium of Intaglio Printmaking, which has key potential in multi-medium use. Which also ironically attributes its actual use to none other than circuitry and technology. It is the appropriation of the medium that works best in this century, the same century where the world is also becoming smaller, and where cultures are mixing and conscientiously interactive with one another. Painting is strengthened and survives through everything but Painting. Can a computer be connected to the idea of a dream state; both being untouchable? Are they made any less real or of importance due to their lack of physical touch? Like in a dream, we cannot touch what is in the monitor or in the frame, until perhaps we print it out. In my work there are elements which begin as creations of the physical hand, which then get developed even more by my digital hand, and then again even more when brought back into the physical world through a print. There is a difference between being a Printer and a Printmaker; the Printmaker is a medium in themselves, complimenting the traditional concept of what a medium is. (Painting, Photography, etc.) My mistakes are seen through my work, misaligned registrations, color mixing errors, just like the glitches that can be found in digital programs and software. It is this that makes hand printed pieces unique. Much like how Warhol’s silkscreens are commercially done without the trace of the hand, yet holding to slight errors of the process itself; even if done by machines. Duchamp really opened the door for the 21st century with Fountain. I have much interest in the relationships between Picasso, de Kooning, Warhol, Rauschenberg, Basquiat and such writers as Kant, Marcuse, and Freud. With each generation, there is the pushing of ideas. Rauschenberg created the “combine painting.” Warhol’s soup cans are ready made in themselves, perhaps mundane as objects, but quite Duchampian; Objects on a pedestal. De Kooning always struggled with his old master training as a painter, and Pollack created something for his time never done before, it was a certain type of thinking. Basquiat creates paintings of word list, which is quite allegorical; text as image. Technology today allows us to print out our work on canvas. We look at artwork and question them, are they painting? Digital? How is it that this work was created, what was the process? In some cases we cannot tell because there is the blurring of mediums. Blurring which is done very well. In our alphabet we use characters to create words and convey ideas. The more letters we use, the more successful we are in communicating. Why not apply this ideological method to the relm of Art? Would combining painting, photography, drawing, sound, etc. not be a better tool for communication? Painting can be seen as a very old and traditional process, in combining all these mediums there is an adaptable strength that is timeless… The hybrid is not formed or confined to the present, it changes and evolves with the technology and ideology of the future. The workshops of Leonardo’s times were designed around craft and technique, many times having a young child apprentice and learn from the master craftsmen. In today’s fast paced world, this process almost becomes obsolete. (Watered down?) In our Capitalistic society, there is no room to pay such a trained artist the money for the time required to do everything by hand. Today’s modern cities are fast paced, and work is offshored, outsourced, and given to the lowest bidder, within reason of quality. The craft is then passed on in some cases to the apparatus. The photographic camera for instance hold within it a mimicry of nature or the human eye. One can say that a photographer needs no skill and that everything mankind has learned through history of optics is represented in the apparatus with a simple push of a button; however we know this is only half true. A photographer knows there is aesthetic and subjective ways of portraying an object. Even in photography much like a canvas, there is a “frame’ or view finder. Everything left out of the image is just as important as what is kept. Even in today’s digital photographic world, there is possibly a loss of the aesthetic eye. Where film is expensive to process and more time was given to composition, today’s world allows for hundreds of images taken with little cost; which may lessen the development of the artistic eye. Today’s world calls for much more social responsibility to the viewer and our surroundings; this I cannot get too into for now. I see the potential in site specific and graffiti based political works, but for now I see this idea as supplemental, or different all together. I will say though, one can display “fine art” and editioned work in public spaces and question the idea of the frame and the institution. Bansky has been quite good at touching on this matter, stemming from Blek le rat. Appropriation in the Allegorical looks to confiscate Imagery and add new meaning. Warhol’s work used serialization or “accumulation” in piling up the repeated image. His appropriation gives new meaning to his iconic imagery, he too experimented with film and sound. (Velvet Underground.) “Everything is on the surface.” Over time, Andy hardly even touched his canvas, using a mechanical industrial process similar to Ford’s “assembly line.” We may observe that today we do not touch what we create on the computer yet we humanize it through manipulation. Is that the difference? 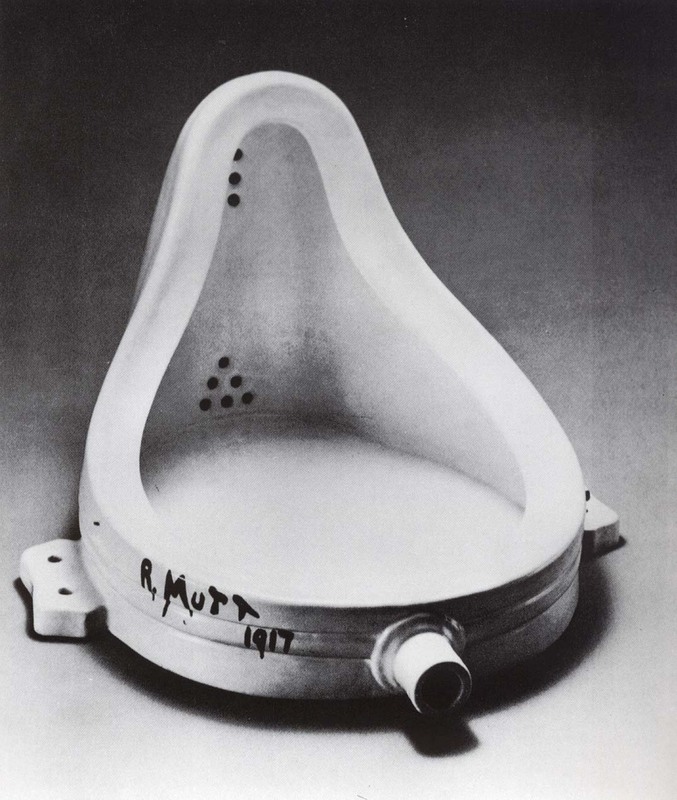 There are no frames in nature, the white wall, pedestal, or frame questioned by Duchamp is important. Object as art, Art as Object, Man as Object. Hybridization seems to have the potential to be the new paradigm for the 21st century. “Allegory is continually attracted to the fragmented” Owens Deconstruction is important, the master and amateur are complimentary. The confusion of genre presented by Duchamp reappears. These different mediums work together like organs in the human body which ultimately power the same force. Freud states that we have become “Prosthetic Gods.” With eye surgery, bionic limbs, and better tailored technology to suit our needs, there is attained a closer connection to the technological sublime. Marcuse states the we must mast and go through all of the hardships of technology and modes of production to be free of the slave mentality. We have become in some extent the creators, yet we still only DISCOVER what we FIND in nature. Technology has improved or advanced more in the last 50 years than for thousands of years on the human timeline. With today’s verge of being worked into nanopower technology, our structure will again morph or change. However, not everyone wants to Modernize, or in some cases of difference, Westernize. If a building as an object represented THE MEDIUM; and a particular medium such as photography, painting, digital etc, were to be separated on every floor, and that building were to collapse (The Crumbling factor of history Then those mediums would be combined through collapsing onto themselves. So much like with the idea of destruction, comes creation through destruction in itself. In my work there are clues to my process much like Andy would jiggle a camera or leave a microphone in a video frame, look close enough and understand the language and one may be able to see the aesthetic vocabulary which is being combined. Water takes on different forms Gas. Liquid. Ice (Solid) yet it is still the component of H20.